Goodgame’s beloved BIG FARM franchise sees a massive update to its mobile title BIG FARM: Mobile Harvest this month, presenting the largest feature update so far. The update will provide players with the ability to develop and build their own in-game Café & Store where they can cook and bake delicious meals with their farm produce, as well as the ability to sell self-produced items such as perfumes and souvenirs. “This update continues a trend of regular, relevant updates for the game that have allowed BIG FARM: Mobile Harvest to see continuous performance gains since its launch in Q4, 2017” says Jörgen Larsson, CEO of the Stillfront Group. The latest update will provide fresh and exciting content for new and veteran players alike. The addition of the Café and Store will add a new dynamic to the game giving players more options for their farm produce, but also providing them with even more entrepreneurial opportunities through running their new businesses in-game, and serving new customers. 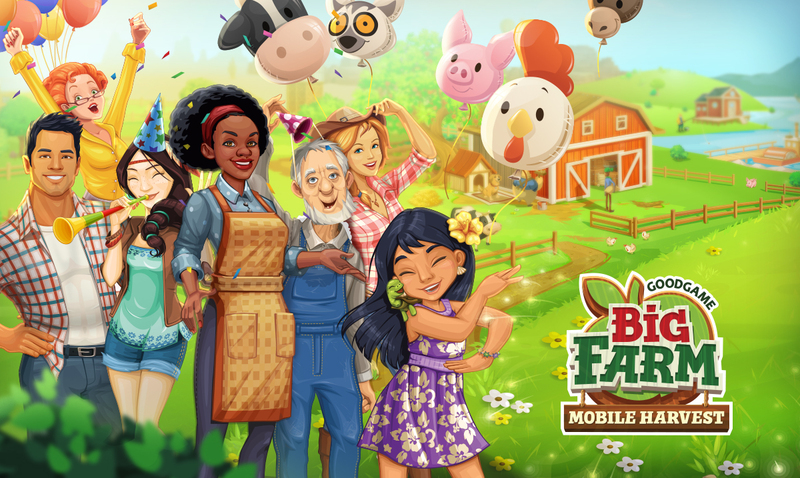 “BIG FARM: Mobile Harvest continues to be a shining example of what a new game launch should look like for our company” emphasizes Kai Wawrzinek, CEO of Goodgame Studios. ”Our ability to scale this game in a highly competitive market, combined with high quality updates for our players have resulted in significant revenue growth per quarter”. “This update is huge for our growing BIG FARM Mobile community of 7.5 million players!” says Simon Andrews, who heads the studio responsible for developing the game. “I know our players will love the new Café & Store as it will give them even more opportunity to run their business and grow their farm”. BIG FARM: Mobile Harvest’s big update will be supported globally by Google Play and will be accompanied by a major TV advertising campaign across 30 channels in Germany, Austria and Switzerland. In addition Goodgame has partnered with inSocial Media and Germany’s most famous and influential YouTube superstar ‘Bibi’, from Bibi’s Beauty Palace, who will be sharing and enjoying the Big Farm: Mobile Harvest update with her 5 million followers.